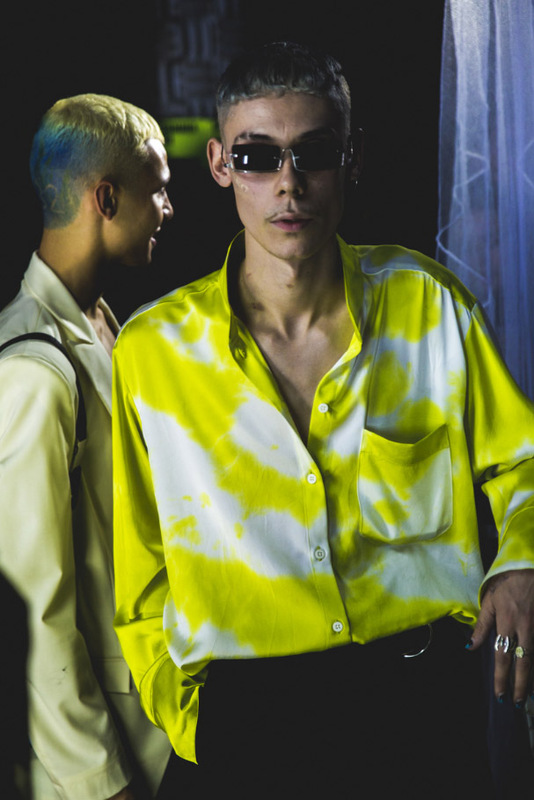 LÉO’s SS19 collection was an ode to holiday memories of euro camping in the early 90s. A mix of acidic colours, snakeskin, and satin created a refreshing and unique collection. The show featured references to camping through to technical fabrics, tent­ like details, mosquito net mesh, and webbing tape. Somehow LÉO ultimately managed to merge the worlds of camping and luxury through an interesting mixture of fabrics and colours. The show was set in a venue that looked like it was ready for a rave contrasted by an eclectic mix of camping necessities. Bottles of water and logo printed toilet paper created a funky backdrop for the clothes and set the scene of a camping trip I think we’d all like to be on. Let’s just say if more camping trips looked like this, I’d be ready to go in a heartbeat.